The first solo album for any singer is important, but if you are an opera singer then it helps to show what roles are in your sights. Love and Prayer is the debut solo album from the lyric soprano Nadine Benjamin. A singer who is having something of a moment, she debuted as Clara in Gerswhin's Porgy and Bess last month [see Ruth's review] at English National Opera, where she plays Musetta in the revival of Jonathan Miller's production of Puccini's La Boheme later this month. She will be singing the title role in Puccini's Tosca on Friday 18 January St James's Church, Piccadilly. 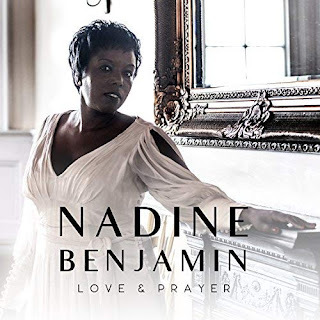 Love and Prayer will go on sale at the ENO shop from Saturday 17 November and she will be signing copies after the matinee performance of Porgy and Bess that day. Recorded at Studio Two at Abbey Road Studios with Kamal Khan conducting the NB Opera Ensemble, it is the first such album recorded by a British Black soprano. The repertoire on the disc focuses on Italian opera, with Verdi at the core, with arias from Tosca, Norma, Il trovatore, La traviata, Un ballo in maschera, Aida, Otello, La boheme and Le nozze di Figaro, plus Schubert's Ave Maria. The opera arias are accompanied by reduced orchestrations for 14 piece ensemble (with Kamal Khan accompanying Nadine Benjamin on the piano for the Schubert). This gives the disc quite an intimate feel, whilst giving us something more than arias with piano accompaniment. We must live in the real world, and not every singer can or wants to have to raise the cash to cover a full scale symphony orchestra and better a small ensemble well rehearsed, as this one, than a badly put together symphonic one. We start with 'Vissi d'arte' from Puccini's Tosca which gives us a strong idea of Benjamin's virtues. We get a firm, focused tone with a lovely shape to full phrases, though perhaps the speed is a little slow. Besides the beauty of phrase, we get clear strong words, something which is true throughout the disc. Next comes 'Casta diva' from Bellini's Norma, the cavatina without the caballeta. This is, perhaps, not quite Norma yet, but Benjamin spins a lovely elegant line. The central group of the disc is a sequence of Verdi arias, which is perhaps where Benjamin's strength lies. We start with 'Timor di me?' from Il trovatore. This is a nicely shapely performance, and the voice is easy over the whole range. Beautifully crafted, there is also a sense of Leonore's inner emotion. This is followed by Violetta's Act One cavatina and cabaletta from La Traviata, and even though the cabaletta is not repeated, it is lovely to get it complete with fa ine contribution from tenor Borja Gomez-Ferrer. The cavatina is both elegant and touching, and Benjamin negotiates the cabaletta well, but there is emotion too. 'Morrò ma prima in grazia' from Un ballo in maschera features a fine cello solo, and is full of lyrical melancholy which develops into something more intense. We get two arias from Aida, 'Ritorna vincitor' is finely concentrated, in nicely impulsive performance which conveys a lot of Aida's emotions. 'O patria mia' is technically strong with a beautifully floated line at the end, with a lot going on. Finally, we have the 'Ave Maria' from Otello, in a performance of tremendous intimacy. Musetta's Waltz Song from La Boheme is delightful, though quite serious yet with enough flashes of wit to make me look forward to seeing Benjamin in the role. The final aria is the Countess' 'Dove sono' from Mozart's Le nozze di Figaro, beautifully elegant with a nice crisp accompaniment. We end with a stylish performance of Schubert's Ave Maria. Technically there is much to admire in all these arias, and in each, there is enough character to intrigue and suggest what it might be like to hear Benjamin in the complete rolls. She sings with lovely gleaming tone, with a fine combination of phrasing and diction. She and the ensemble create a nice sense of intimacy with some superb solo playing.